Mondo Fruitcake: Fruitcake Tasting 2015!! 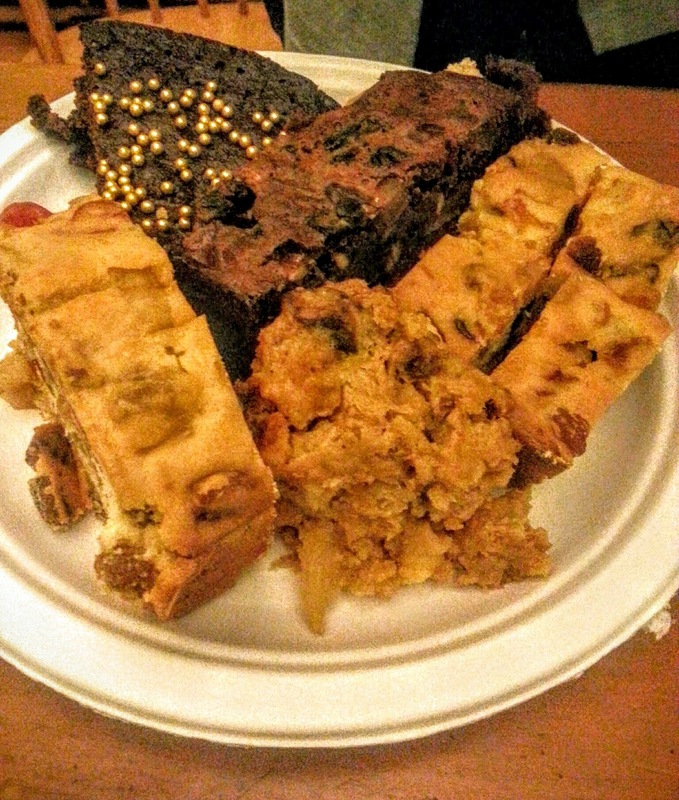 Last night was the annual Fruitcake tasting party at my friend Sherry's house. This event has truly evolved. A couple years ago we featured primarily purchased fruitcakes featured on this blog, with only one homemade cake. 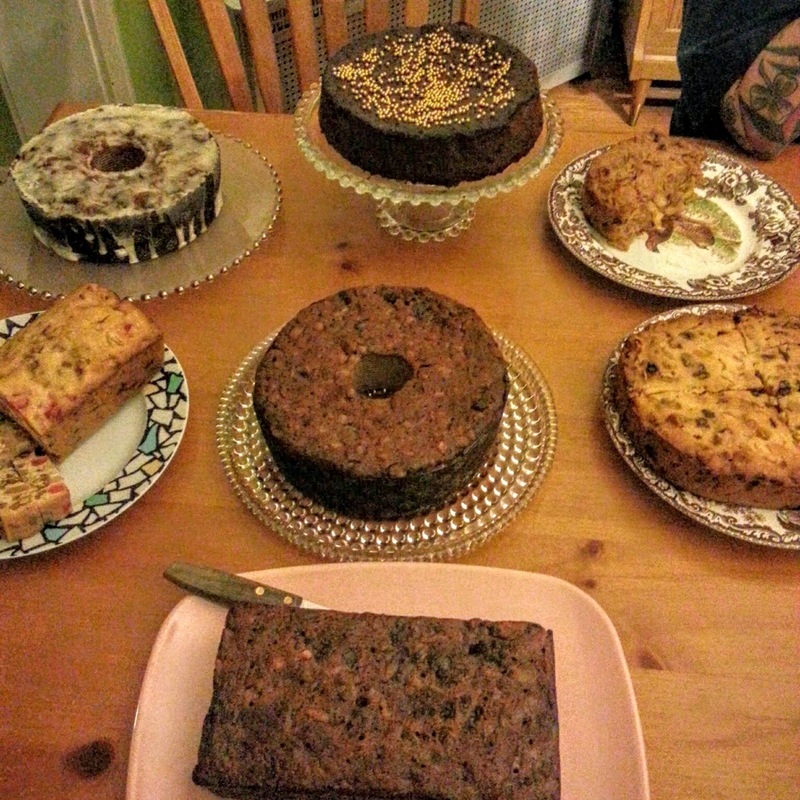 This year, there were seven--yes, seven-- homemade fruitcakes featured. Another interesting progression has been our attitudes toward fruitcake. Previously, the attendees were fruitcake-curious. Now they are full on fruitcake aficionados, defenders, and even proselytizers. The Owl's Brew Coco-lada was very delicious mixed with vodka, because it created a cocktail that was fruity and coconut-y, but also light and not cloying. Certainly when you're steeling yourself up to plow through six fruitcakes, you don't need cloying. The center fruitcake is one from the New Antoinette Pope School cookbook, an older cookbook, I think from the '70s, and a local Chicago favorite, the Antoinette Pope School of Fancy Cookery being based in Chicago. Toasted Almond Fruitcake (Couldn't find a link but it was a recipe from an old Good Housekeeping Cook Book, copyright 1949). PLUS two more loaves. I think I'll be set for the year......except I have family members with whom I must share my bounty. We'll see about that. Anyway, on to the tasting. I'm going to group these into the darks, the whites, and the others. I won't be mentioning any Southern-style fruitcakes (which I define as very sweet, almost candy-like, without alcohol), because, it turns out, we all like our fruitcakes plenty boozy. The two white fruitcakes were the Mary Meade White and the Apricot-Macadamia. Both of these I would consider "gateway" fruitcakes or "fruitcakes for beginners." They both were more like rich pound cakes with fruit (and booze) added. They were both delicious--keep in mind we had already had cocktails and eaten pizza, so I think a lighter fruitcake was welcome. They were well balanced, boozy, rich, and with a nice pound-cake-type crumb. The macadamia-apricot cake in particular was on the edge of what you could consider fruitcake, versus the Margaret Meade, which had cherries in it and so seemed a bit more fruitcake-esque. We all agreed, however, that these were delicious. The darks included the Toasted Almond, the Nigella Lawson, and the Antoinette Pope, although the latter was more of a happy medium. I made the toasted almond and on first tasting it, was not a big fan. There is a lot of raisin in this fruitcake, and anyone who has read other posts knows what an un-fan of the raisin I am. This one also has a lot of molasses, and I used stout in the batter as well, so overall the cake had a very dark, toasty flavor. The others in the party, however, liked the unique flavor, and I have a feeling that on its own, I will appreciate this more as the rich, dark, spicy cake that it is. The Nigella Lawson is also a rather dark fruitcake, having cocoa in the batter, which I'm sure gives it a darker flavor. It does not, however, give the cake a chocolate flavor, so if you were hoping for chocolate gooiness, this is not that cake. 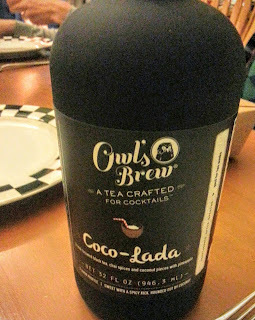 There are prunes in this one and overall it also shares that dark, rich spiciness. It's very elegant as well if you choose to decorate it as my friend Sherry did, with gold dragees. Coming in sort of in the middle of the ones I've mentioned so far was the Antoinette Pope. This is a classic, quintessential fruitcake, boozy, fruit-filled, and spicy, but not overly so. My friend went with a lot of citron and peels for her fruit mix on this one. I personally love orange peel because it gives cakes a fresh, bright flavor, but this was tempered with the slightly bitter taste of citron, which added complexity. I liked this recipe as a very nice take on a classic fruitcake. On to the last two. The White House fruitcake was my favorite of the night, primarily because it was flat out sweet due to the delicious apricot glaze and icing. It was a really moist, boozy cake. If you peruse the recipe you'll see that it has a few different additions--almond extract, dried pears, etc---that adds to its uniqueness. The final was a really unique cake or bread, called barmbrack, a traditional Irish fruitcake or bread. Upon a little investigation I learned that it's actually associated with Halloween more than Christmas, but I was thrilled to have this on the table. It has a really unique and yummy flavor, containing dried fruits like apples, and those fruits are soaked in tea. It was really unique. The one we had was a bit too moist and resembled in a way a bread pudding, but it was delicious. Definitely a recipe to investigate in the future. There was some interesting discussion about the amount of care, time and let's face it, money that goes into making a fruitcake. We discussed going super hard-core and candying our own fruit for next year--but honestly, then, the preparation for these cakes would have to start in summertime, and as it is we were baking cakes around Halloween. What I take away from those discussions, however, is a real appreciation for what a fruitcake is--a celebration of bounty, richness, time, and love, all combined in one cake.